I remember attending a 4th of July picnic by Northwestern University in 1995. I wasn't a huge alternative music fan, but one of my friends played the album Jagged Little Pill. Usually, it took at least three listens for me to fall in love with an album, but I was instantly hooked on Alanis Morissette's latest effort. I had heard "You Oughta Know" on a new music special, but it didn't completely burn in until I heard it at the picnic. All of my friends, who were diehard alternative music fans, couldn't stop bragging about how much the song meant to them. Everybody could identify with this song as well as others from the album. During that summer, they became Alanis Morissette "stans." The funny thing is that three years later, they wouldn't be caught dead listening to Morissette's new album Supposed Former Infatuation Junkie, though -- technically, at least -- the album was just as good as her 1995 megahit. For them and many others, Alanis Morissette had "ruined" alternative music. Back in 1995, however, Morissette lent a voice to feminists, gay men, lapsed Catholics, and others. Her music and voice displayed a repressed angst that sold incredibly well since many could identify with it. "You Oughta Know" was about a jilted lover everybody had at one time or another. "All I Really Want" was about a hostile relationship. Perhaps the most powerful song on the album was "Forgiven," a song about Catholic guilt, hypocrisy, and (possibly) abuse before the world was comfortable talking about this in the early 2000s. It was as if Alanis took the confronting feminist mantle from Madonna and explored the topics of sexuality, repression, and non-guilt for a new generation of women. Ironically, Jagged Little Pill was released on Madonna's record label Maverick. In 1995 and 1996, Alanis Morissette was literally Queen of the Universe. There were some lighter and fluffier songs on Morissette's album such as "Hand in My Pocket" (about discovering positive things in negative situations), "Ironic" (hope you never have rain on your wedding day) and "You Learn." Alanis's popularity peaked during the Summer of 96, when she toured to promote Jagged Little Pill. I remember seeing her at the Poplar Creek Music Theater near Chicago. It was a great show in which the audience was really involved. The only thing I didn't like was how Morissette constantly did some move where she circled around and pulled her hair. Still, it was one of the most memorable concert experiences of my life. Soon, the backlash started. It didn't help that Morissette won five Grammy awards the next year. For many people, Alanis took alternative music and turned it into mainstream music, which was cheapened even more after she won all the Grammys. More and more, people doubted her authenticity, especially since she recorded two fluff pop albums as a teenager. Morissette would soon be dissed by Joni Mitchell and Jagged Little Pill was named the worst album of the year in a late 1996 Rolling Stone reader's poll. 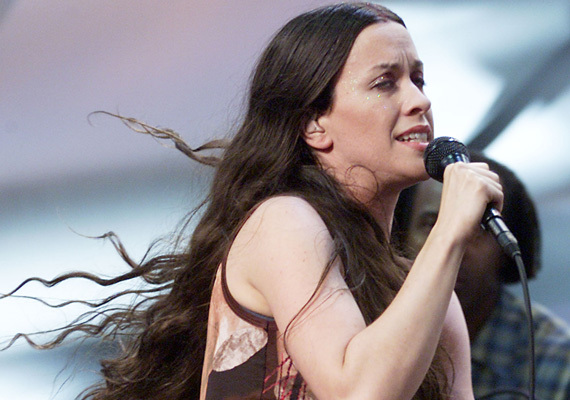 Alanis was able to produce one more big hit in 1998 with "Uninvited" from the City of Angels soundtrack. Later that year, her new album Supposed Former Infatuation Junkie sold well at first, but faded away fast and failed to produce a top-ten hit. The album garnered excellent reviews, but the backlash and the new music scene, now filled with teen pop and hip hop, did Alanis in -- at least in terms of commercial success. Despite this, Mrs. Morissette has remained true to herself both musically and professionally. Even without a top ten hit, Alanis Morissette can take solace in the fact she inspired a generation of woman and gay men to express their anger, overcome repression, and be true to themselves. For the rest, she made what is perhaps the best album of the 1990s.